Elle: So the past several days I've experimented with the "Ultra Recovery Week" theory, otherwise known as my impersonation of a lump. I had decided to take Sunday off after last Saturday's running adventure. Then I decided to take Monday off. I did an hour spin class on Tuesday before heading out to Emily Sweeney's book signing at Stoddard's. It was good to see some friends I hadn't seen for awhile. 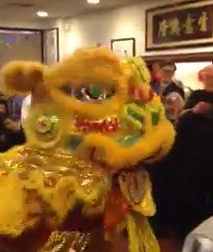 And then I took off Wednesday to go out for a restaurant anniversary and Chinese New Year celebration, complete with a dragon dance. And whaddya know, I went ahead and took Thursday off. I don't necessarily recommend this kind of 'extreme' recovery week. For myself or anyone else. I had a fun time, but now it's time to get focused and start logging some serious training time. After all, the first 'race' of the season (Ragnar Relay del Sol) is 3 weeks away! Webb: Elsewhere, I have tried to maintain my training during a typical recovery week. I've backed off the volume and backed off the intensity a bit. Unfortunately, I've had a couple of late nights at the office that threw my schedule off. If this was a normal week I might have done a late night workout. However, since this is technically a recovery week, I allowed myself to skip a workout and do a couple of more intense workouts (SEAC Thursday hill repeats and thesufferfest.com's Angels). We have an 8 mile run planned tomorrow with the SEAC Saturday morning crew and possibly an easy turbo session on Sunday. Next week we pick up the volume and intensity incrementally to begin the next training block. I also attended Emily's book signing. The book looks great; I'm looking forward to reading it as soon as I finish my current read. 1900m of Something Called "Swimming"